It’s not yet clear what happened, but attention is likely to focus on the turbine’s ability to shut itself down in high wind. A wind turbine normally shuts down when winds reach 55 mph – but something clearly went awry in Ardrossan, perhaps causing excess current in the generator windings, which may have led to the fire. The shutdown is normally performed by ‘feathering’ the turbine blades so they do not turn. “In general the turbine blades will pitch out in high winds, keeping the turbines in idle mode,” confirms a spokesman for the turbine’s manufacturer, Vestas of Aarhus, Denmark. Another source of the problem may be a fault in the turbine’s gearbox, which ensures the rotor speed is adjusted so that the generator provides electricity that matches what is required by the grid it is feeding. 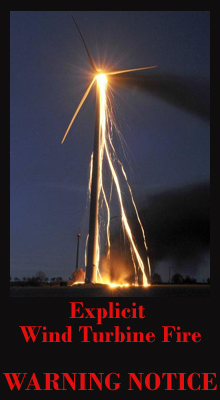 The accident is now under investigation by Vestas and the wind farm’s operator, Infinis of Edinburgh, UK. Infinis says that the site has been disconnected (PDF) from the grid as a “precautionary measure” while it investigates the cause of the blaze. That the turbine shed large pieces of flaming material will also be of some concern to people living close to such installations – and will almost certainly fuel future planning permission objections from vocal anti-wind farm groups like Country Guardian – not to mention the sheep who were grazing happily below.